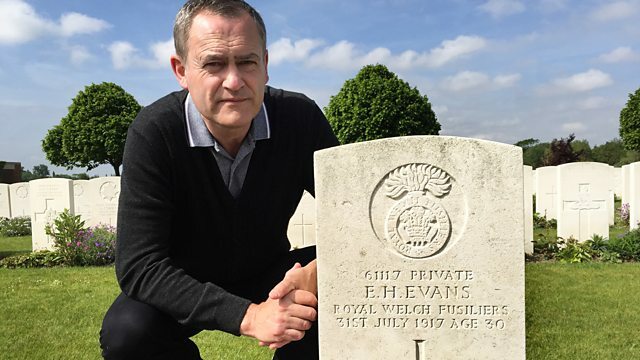 Documentary in which Ifor ap Glyn reassesses the life and work of Welsh poet Hedd Wyn on the centenary of his death. The story of Hedd Wyn is one of Wales's enduring tragedies. A young man with little or no education succeeds in winning The Chair, one of the main literary prizes at the National Eisteddfod, but is killed in WWI before he could claim his prize. To mark the centenary of his death, National Poet of Wales Ifor ap Glyn reassesses Wyn's life and work. His journey takes him from Trawsfynydd, where Hedd wyn was born and raised, to Liverpool, where he was trained to fight, and onwards to France and Belgium, where he was killed in action on 31 July 1917. In 2013, Hedd Wyn's home at Yr Ysgwrn was sold by his nephew Gerald Williams to the Snowdonia National Park Authority. 88-year-old Gerald wanted to preserve Wyn's legacy for future generations. Ifor visits Hugh Hayley, one of Britain's leading furniture conservators, to gain an insight into the remarkable woodcarvings embedded into the ancient oak of Wyn's Black Chair. In France and Belgium, Ifor retraces the poet's final weeks, days and minutes. His successful poem, aptly titled Yr Arwr (The Hero), was finished and sent from the trenches, and his florid yet absorbing letters from the front seem to paint a picture of a young man who still felt the creative urge, amidst all that went on around him. Featuring fascinating first-hand accounts, interviews recorded during the 1960s and 1970s with family and friends, and contemporary archive material from WWI, Ifor reassesses the poet's legacy. Why does this story continue to fascinate us so? What would Hedd Wyn have achieved had he lived? Maybe these are questions that can never be fully answered, but one thing is for certain, Hedd Wyn's legacy persists.